How Does a Freezer Work? Composting Toilet Guide 2018: What’s the Best Model? How does an Oil-Filled Heater Work? How is a Fire Extinguisher Recharged? Why Build a Tiny House? Sometimes our cooking adventures don’t always go to plan. Read on to find out how to get the burnt smell out of a microwave and remove the smokey smell from the house. If you’re wondering how to deodorize a microwave because you burnt your movie popcorn or reheated your leftovers for too long, don’t worry. There are several solutions to your problems! We have all been too lazy to clean out crumbs and spilled food in the microwave that burns and leaves stains. But you want to get that burning food smell out as soon as possible because it tends to stick around on fabrics, your hair, and any other food you plan to microwave in the future! 1. Microwave a bowl with 1 tbsp vinegar and 1/2 cup of water for 5 minutes. Leave it in there and let it steam for another 15 – 20. 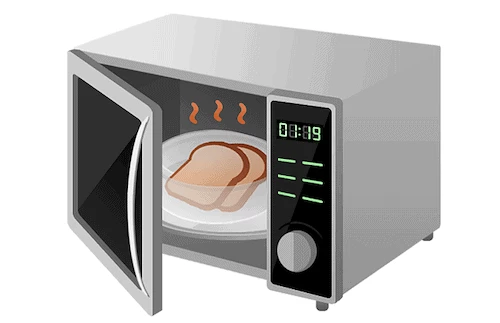 After, clean the burnt food out of the microwave interior—the steam should facilitate the removal. Leave the microwave door open to dry. White vinegar works best to neutralize the smell of burning food and remove stains. Apple cider vinegar will work as well, but is more expensive and may require a higher ratio of vinegar to water. 2. Use a sponge soaked in white vinegar or nail-polish remover to remove the burnt detritus that refuses to come off. If you use nail polish remover, make sure to wipe the surfaces down with food-safe soap and water too. 3. For an exceptionally smelly microwave, take a lemon, slice it in half, and microwave for 3 minutes. Or microwave a bowl of water with submerged lemon halves. You can also microwave a mixture of water and lemon juice. Leave overnight. 4. If you don’t like the smell of lemon, try using another citrus fruit like oranges or grapefruits. Another option is to use a bowl of water with a few drops of citrus oil added to it. A washcloth or some paper towels soaked in this solution will also work but keep an eye on it! If the cloth or towels get too dry, they could catch fire. 5. Add 2 – 3 drops of cheap vanilla extract in a bowl of water and microwave. As an added bonus, your microwave and house will smell like freshly baked cookies! You can also microwave a cup of coffee (add a little bit of cinnamon, cloves, nutmeg, or other spices if you like). 6. Use baking soda! Leave it in the microwave or in the kitchen overnight. You can use this trick with your fridge and bathroom too. 7. Leave a bowl of coffee beans, grounds, or instant coffee inside the microwave overnight. If you don’t like the smell of coffee, try using cinnamon sticks or a ¼ cup of cloves. 8. If the smell cannot be removed or it persistently returns, you may try leaving it outside (weather permitting) or in the garage / cellar with the microwave door open. If this doesn’t work, you have no choice but to replace the microwave. 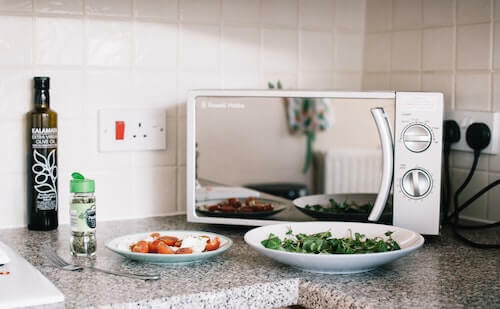 Recommended reading: See which compact microwave we recommend over all others in our massive guide. 1. Throw out all the burnt food, and if you burnt the food in the microwave, clean that first. Double wrap the garbage bag or take out the garbage—the burned remains will continue to release odors from inside the garbage bag or can. If you leave the burnt food in the garbage bag overnight, you may want to deodorize the garbage bin or can as well. Do not dump the food down the garbage disposal! This will only release more of the smoky smell. 2. Soak a washcloth in a mixture of water and vinegar. Squeeze out the excess liquid and wave it around the room. Leave the washcloth hanging overnight in the room with the worst smoke smell. 3. Open your windows if you can and turn on fans to increase air circulation. This will encourage the smell to dissipate more quickly. 4. Wipe everything down. Add a few tablespoons of white vinegar to a spray bottle filled with water and use it to clean the walls, furniture, floors, doors, and so on. Don’t scrub too hard and wear protective gloves as the vinegar may burn and/or irritate your skin. 5. Shampoo your carpet. You can also sprinkle some baking soda over the carpeted areas, leave overnight, and then vacuum. 6. Wash your clothes, bedsheets, couch covers, throws, and fabric curtains. Use scented detergent or a deodorizer to help remove any lingering smells. If you hang your clothes to dry, dry them outside. 7. Place any shoes, boots, jackets, etc. made of fabric or suede outside or in the garage until the smell has dissipated. Try wiping them down with a dryer sheet if they still smell after a few days. 8. If the smell persists, take a sniff in your closet and pantry. Sometimes odors can cling to cardboard and plastic containers. 9. Place some lemon quarters, onion slices, or vinegar into hot water and leave in the areas of the house most affected by the smoke or smell of burning food. 10. If cleaning, wiping, and laundering everything still doesn’t remove the odors, try replacing the burnt food smell with something more pleasant. Bring out those air fresheners, bake cookies or a fruit pie, or use an essential oil diffuser (if you don’t have one, add 5 – 10 drops of your favorite essential oil to a spray bottle filled with water and spritz that around the house and onto fabrics). 11. Leave bowls of coffee beans or grounds inside cupboards, closets, and small rooms to absorb and replace the smell of smoke. Baking soda or activated charcoal will also work if you prefer a scent-free option. Of course, if all else fails—ask mom how to get the burnt smell out of the microwave. She’ll know what to do. If you have any tips to add then let us know in the comments section down below! To see more useful articles like this follow TinyHouseHugeIdeas.com on Facebook and Pinterest. Let us know what you think down below! © 2019 Tinyhousehugeideas.com All rights reserved. Tinyhousehugeideas.com is a participant in the Amazon Services LLC Associates Program, an affiliate advertising program designed to provide a means for website owners to earn advertising fees by advertising and linking to amazon.com, and any other website that may be affiliated with Amazon Service LLC Associates Program.